Andy Kirk studied music under Wilberforce Whiteman, father of Jazz pioneer Paul Whiteman. Kirk started playing bass and tuba in Denver with George Morrison’s band, and in 1925 he joined Terrence Holder’s Dark Clouds Of Joy. 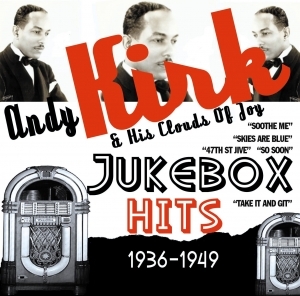 In 1929 he took over leadership of the band (which was renamed Andy Kirk’s Twelve Clouds Of Joy) and moved to Kansas City. During 1929-30 they recorded some excellent hot performances with such players as Mary Lou Williams and violinist Claude Williams. In 1936 the band relocated to New York and immediately had two huge pop hits. First, a version of Fletcher Henderson’s theme, “Christopher Columbus” and then with the original version of the now standard ballad “Until The Real Thing Comes Along”.